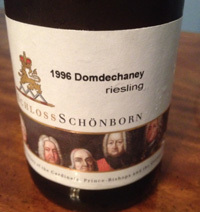 1996 Schloss Schonborn, Riesling, Domdechaney, Rheingau, Germany. Graf von Schonborn Schloss Schonborn is one of the Rheingau region’s classic estates and has been making wine under the Schonborn family since 1349, it is located near Hattenheim, there are single estate wines and they have holdings in the top vineyards in the area, these are classic wines and wines that age beautifully. The 1996 Domdechaney is an off dry example of Rheingau Riesling with wonderful fruit intensity and layered charm, opened on Thanksgiving with friends in 2014, this glorious golden/yellow hued Riesling at 18 years old is showing fantastic with rich flavors, mature stylish grace and density. This is why Riesling is a such a great value for cellaring, you can get a reasonable Riesling under $30 or $20 even and it will age superbly and give great rewards, like this one from Schloss Schonborn. The 1996 Schloss Schonborn Domdechaney opens with that brilliant color, and the bouquet is deep with rose oil, hints of mineral, petrol and honeycomb as well as clove spice, leading to a complex palate of baked apple, tangerine, lychee, dried apricot, honeyed pear and a mix of citrus and tropical fruits with touches of mushroom, brine, salted caramel, flinty stones, peach tart, apple butter and nectarine flesh. This classy Riesling is mildly sweet, but feels remarkably balanced and it has plenty of life, utterly delicious and compelling, drink now, and for another 3 to 5 years easy, this is sublime stuff with nice weight, depth and vigor, it flows with seamless grace on the palate with luxurious mouth-feel and a lingering aftertaste of pure pleasure.